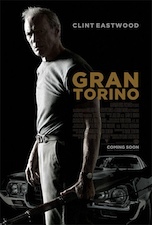 Having recently viewed Avatar in 3-D, twice, it’s kind of strange to watch a movie like Gran Torino. While the former was a glorious cacophony of sight and sound, the latter is brilliantly simple and yet in many ways, far more powerful. Avatar represents the pinnacle of modern special effects and sensory experience (notice I did not say sensory overload. That distinction would belong to Transformers: Revenge of the Fallen). Gran Torino, meanwhile, represents what might be considered the pinnacle of sheer characterization–the most basic elements of storytelling stripped bare of all fanciful special effects, visual trickeries, or even music. It is a brilliantly simple story with wonderfully complex characters at its center, and its message carries a weight that goes far beyond the feel-good save-the-day tales that are so popular in Hollywood and literature. Gran Torino, directed by Clint Eastwood, tells the story of a man named Walt Kowalsky who has lost much: his wife is dead, he hardly knows his children, he hates his neighbors, and his lone companion is a faithful canine named Daisy. Meanwhile, the neighborhood he has lived in for decades is changing: Hmong families are moving in to the surrounding houses, and the threat of gang violence begins to rear its ugly head too. Kowalsky, played by Eastwood, is a grizzled veteran of the Korean War who is one of the grumpiest old men to ever be portrayed on the silver screen. And while he clings bitterly to the defining moments of his life from the War that have haunted him for decades, he slowly realizes that the world around him is changing and indeed has already changed. And there’s not much he can do about it. Kowalsky showing the neighbor boy how to be a man--by getting a job as a construction worker. Kowalsky is no hero–he does not pretend to be one now, nor does he claim to have been one during the War. But he ends up doing what might be considered a heroic deed when he saves one of the youths who live next door from being roughed up by a local gang. Mind you, his motivation isn’t to save the youth, but to brandish his sense of military power as if it were a sword–to prove to the gang and to himself that he isn’t afraid of anybody, least of all the weak-minded foolish gang members who thrive on the sort of cowardly violence that is so prevalent in their circles. But his act is interpreted as heroism by the locals, who befriend him against his own will: they bring him food and he is invited to a gathering at the house next door where he even learns to appreciate a bit of their cooking and possibly even their culture. 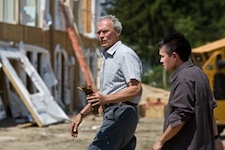 At this point, Gran Torino might seem like a dressed-up after school special on racism. But it’s the gritty realism showcased in the film that gives it a weight far beyond any NEA-endorsed treatise on being nice to others. Kowalsky is mean, with a vocabulary dripping with some of the filthiest epithets I have heard onscreen in a long time. Eastwood cuts no corners in depicting the violence of the local gangs, and the bitter mindset of Kowalsky and his friends. And it’s this sense of reality that draws the viewer in and makes Kowalsky’s story all the more believable. When he eventually befriends a boy next door and takes him under his wing, despite the fact that the boy tried to steal his precious Ford Gran Torino, their relationship is entirely believable simply because it doesn’t really work. Not at first, anyway, and not for a long time. But when it does, it eventually leads up to one of the most powerful and emotional climaxes I have seen in recent memory. Yes the film does have a message about racism, but I can’t think of a more powerful way to preach it. By far the most convincing "Get off my porch" ever spoken by an old man. Eastwood has had a long and storied career–he has made dozens of films as an actor, and during the past fifteen years he has left his mark on cinema as a director to be reckoned with. And though some of his films have been too overtly political for my taste (the ending of Million Dollar Baby reeked of typical Hollywood-style proselytizing), it’s clear that he wants to leave his mark on the world in a way that matters. He has said that Gran Torino was his final acting role, after which he will presumably continue to direct until someone pries the camera from his cold, dead hands. It’s ironic that a man in his seventies would be so prolific, with films of such quality, but I hope he is able to continue his work for a long time yet. As a side note, I also appreciate the film’s treatment of Christians. Kowalsky is not a churchgoing man, but the persistent priest at the church his wife went to eventually does break through to his heart–if only just a little bit. But the priest and the Church are not mocked or disrespected as so often happens in movies. The priest is young, energetic, and woefully inexperienced at dealing with men like Kowalsky. But he and his profession are not treated as a joke, and the priest comes out as almost as much of a hero as Kowalsky. That’s a rare thing for Hollywood, and one aspect of this movie I highly respect.